TUESDAY, 27 SEPTEMBER – Universiti Malaysia Sabah (UMS) continues to excel in records management when it received a five-star rating recognition, thus was named as the Best Public University in Records Management for the year 2016. The rating was the result of an audit conducted by the Malaysia National Archives on the implementation of records management, recently. 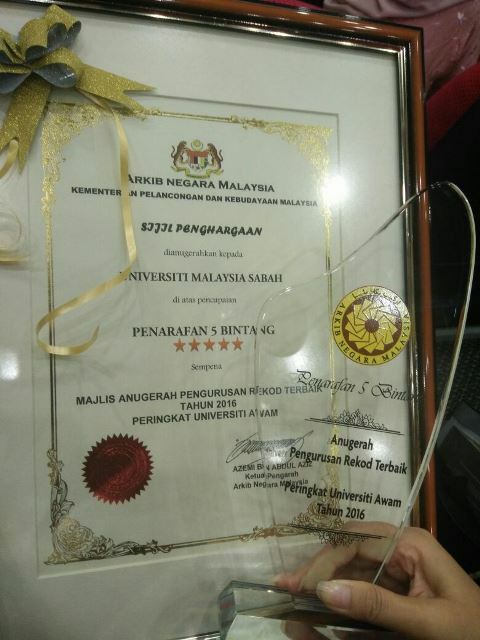 The achievement puts UMS on par with two other public universities namely Universiti Teknologi Malaysia (UTM) and the International Islamic University (IIUM), which also received a five-star rating, ahead of Universiti Putra Malaysia (UPM) and Universiti Kebangsaan Malaysia (UKM) which received four-star rating. This was announced in an appreciation certificate presentation to representatives of public universities in conjunction with the Best Public University Records Management Awards 2016 held at the Malaysia National Archives, presented by the Deputy Secretary General (Management), Ministry of Tourism and Culture Malaysia, Dr. Junaida Lee Abdullah, today.